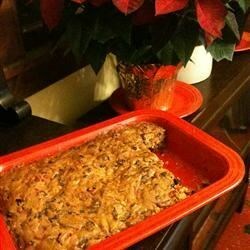 Grease an 8 inch square baking dish and line it with parchment paper. Set aside. In a large bowl, combine the flour, mixed spice, cinnamon and lemon zest. Stir with a whisk until blended. In a separate bowl, cream together the butter and sugar until light and fluffy. Beat in the eggs one at a time, mixing until each one is blended in. Stir in the dry ingredients just until moistened, then fold in the raisins, golden raisins, currants, cherries and almonds. Spoon into the prepared pan and smooth the top. Make a slight impression in the center with the back of a spoon so the cake will turn out level. Cover and leave in a cool place overnight. Preheat the oven to 300 degrees F (150 degrees C). Place the cake pan on a baking sheet. Bake for 4 hours in the preheated oven. When the cake is done, a skewer inserted into the center should come out clean. Cool in the pan for 1 hour, then turn out onto a wire rack and remove the paper. When completely cool, poke with a skewer every inch or so, and spoon brandy into the holes. Wrap in waxed paper and store in a cool place until serving.